What’s So Bad About Tile Dust? Not only is tile dust messy, it is also dangerous. Long-term exposure to tile dust can bring about a number of health issues. When renovating your home, you want to take as many precautions as possible to keep you and your family safe. Everyone has probably heard of dust, but do you really know what it is? More than half of the household dust is soil that has been brought into your home by shoes, bare feet, or airborne particles. The other half is an assortment of debris such as skin cells, food products, mold, kitchen grease, and more. Dust also contains bacteria and fungi. The average American household contains up to 7,000 types of dust-related bacteria and 2,000 species of fungi. Your carpet alone can contain up to 200,000 bacteria per square inch. During the floor removal process, any of the bacteria or fungi trapped under the tiles can be released into the air with the tile dust. Chemicals can be found in dust. Many popular construction materials, such as tile, contain a material called crystalline silica. When the tile is broken apart and removed, crystalline silica can be ground down to microscopic particles and released into the air, creating dust that can lead to a variety of health complications. Crystalline silica is a lung carcinogen, meaning that constant exposure to this tile dust would cause serious lung problems. Whether you are removing tile, hardwood flooring, or carpet, the only way to have a dustless floor removal is to have the right equipment. With all of the dangers of dust inhalation, don’t take the risk. Call in the experts. Speedy Floor Removal offers several floor removal packages that will leave your home free of dust. Speedy Dust Collection Systems collect almost one pound of dust per square foot, and our HEPA Certified Air Cleaners capture dust unseen to the eye. To learn more about our virtually dustless floor removal process, contact Speedy Floor Removal today. Tile is a great flooring choice for many Floridians due to its durability and ease of cleaning. However, after a little wear and tear, homeowners find that their tile floor is uneven. An uneven floor is not only displeasing to the eye, but it is also dangerous. Children and adults of all ages are more likely to trip and fall due to an uneven floor. Uneven floors also allow dirt and moisture to enter below the tiles which can cause damage and mold buildup. If you find that your tile is uneven, whether it be right after the contractor leaves or years after your tile was completed, there are a few reasons why this could happen. Below, the floor removal experts at Speedy Floor Removal has compiled 3 common reasons tile can be uneven and what you as the homeowner can do to fix it. Epoxy is a high-strength adhesive used to glue down flooring. When replacing tile or carpet, this adhesive needs to be removed by special equipment before installing newly purchased flooring. In some instances, because epoxy is challenging to remove, a contract will smooth over the old layer with a new layer of epoxy. This can ultimately ruin your new flooring and cause unevenness throughout your home. Before your contractor installs your new flooring, ask him or her about the epoxy and its risk of damaging your floors. 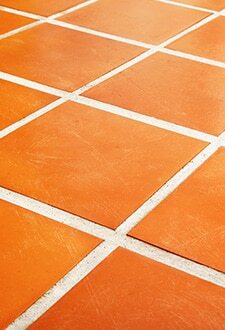 Lipping can also lead to chipping of the tiles where the floor between tiles is uneven. Before you hire your installation contractor, check the web for reviews in your community to lower the risk of hiring someone unqualified for the job. Ceramic floor tiles are not affected by standing water; however, the grout between the tiles can become damaged. Sometimes it is easy to detect flood damage, but other times, such as a slow leaking pipe, can be harder to detect and the water can damage the grout and cause the tiles to become loose and uneven. Not only can it cause the tiles to shift, but if the water sits too long and goes unnoticed or untouched, it can cause mold or dark staining. Unfortunately, the best resolve uneven flooring is by starting from scratch. Here are the proper steps to remove your flooring so the outcome is perfectly even floors. Hire a floor removal contractor – a proper floor removal starts with the experts who remove all glue and debris from your floor. Find a reliable installation contractor – even though Speedy Floor Removal doesn’t install flooring, let us help you find a reliable contractor in the Jacksonville, Orlando, Tampa, and Gainesville areas. Select your new flooring – new tile floor or switch to hardwood? Work with your local contractor to decide which floor is best for your needs. Removing your tile floor is a timely, messy, and exhausting task. Let us do the hard work by removing your tile and eliminate your concerns. Speedy Floor Removal not only provides tile removal services, we also remove carpet, paint, hardwood flooring, and more! Call our experts today for our virtually dustless floor removal services. The process of removing tile and thinset can be messy; however, a virtually dustless floor removal prevents dust from filling up your home and settling. Having the proper equipment reduces airborne dust that ends up collecting in all areas of your home. We guarantee that our virtually dustless floor removal process captures about one pound of dust per square foot. Therefore, our virtually dustless process is cleaner, safer, and healthier than standard floor removing services. While there are dozens of flooring options to choose from today, it may seem at times that certain types of flooring specialize in only one or two worthy features. Some are extremely durable but also pretty difficult to install. Some feel great underfoot but are hard to keep clean. Others are economically priced but do not offer a wide range of styles, and a few kinds are environmentally friendly but not family friendly. In these flooring situations, it seems that you have to choose your preferred characteristic and settle on the rest. However, there is a flooring alternative that does not place homeowners in such a compromising position. This flooring material is both durable and stylish while still being easy to afford, easy to install, easy to clean, and easy on the environment. It may sound too good to be true, but this is the reality of laminate flooring. The winning qualities of laminate flooring designate it as an outstanding flooring choice for any home, and Speedy Floor Removal is here to share more about these winning qualities of laminate flooring with you. With a core of high-density fiberboard, laminate floors are exceptionably durable and resistant to wear and tear. In fact, laminate floors are virtually immune to stains, spills, and scuffs, and they can actually be five times more scratch resistant than hardwood floors. Therefore, laminate floors can look just as elegant as hardwood without instilling nearly as much worry in homeowners. Laminate floors are even sealed with a tough melamine wear layer, so they can last longer than hardwood, vinyl, or carpet all while remaining impervious to cats, dogs, kids, and high heels. Additionally, most laminate flooring comes with extensive warranties that supply protection against fading and moisture damage. You can install laminate floors just about anywhere in your house: they work great in bathrooms, kitchens, living rooms, dining rooms, playrooms, and entryways. If you need a durable floor that does not demand much maintenance, laminate floors are the ideal choice that can handle all of your high-traffic areas. Laminate flooring comes in a significant variety of styles, colors, and patterns, so the design possibilities with laminate are practically limitless. Laminate stands as such a versatile flooring type because of its composition: laminate planks or tiles are made of layers of plywood or compressed fiber backing topped off with a photograph covered with a plastic coating. The fact that realistic photography is incorporated into this flooring means that laminate can be visually indistinguishable from real wood as well as stone, ceramic tile, and stained concrete. The technology of laminate flooring enables you to imitate most any kind of flooring in your home for a much lower price. Furthermore, the feel of laminate is a major plus: its soft, warm surface provides a corresponding experience underfoot to hardwood and an improved experience over ceramic or stone tile. Laminate is certainly one of the cheaper flooring options available today. With a lower price point than hardwood for an extremely similar look and feel, it affords considerable value to hardwood lovers. 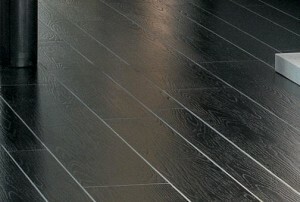 Laminate is also a particularly economical option when buyers consider its durability and longevity as well. Most types of laminate flooring can be floated over the existing floor, which literally makes installation a snap. Without the use of glue, nails, or staples, floating floors involve individual planks that lock together with a tongue and groove system that joins securely while avoiding the need for attachment to the subfloor beneath. Tearing out old floors is unnecessary because laminate flooring can lie directly above dry concrete, wooden subfloors, and many other non-textile flooring types. A low clearance space height also enables laminate flooring to more easily enter older homes with thicker floors. The simplicity of installation that laminate flooring allows saves homeowners a lot of time and money and creates a flooring type that can be uninstalled and replaced in a quick and uncomplicated manner. As laminate floors are so resistant to most kinds of damage, they are easy to clean and maintain. Laminate floors can be cleaned with a vacuum, a damp cloth, and most household cleaners. Removing stains is simple with laminate flooring: even heavy marks and stains wipe away with acetone or other solvents containing alcohol. Cleaning and keeping laminate is definitely not a hassle with its low maintenance material: the unique surface of laminate avoids the need for waxing or varnishing. With their hard, smooth exterior, laminate floors do not allow dust to accumulate the way that carpet fibers do, so they are actually a hypoallergenic flooring choice that is safe for people with allergies as they preserve healthy indoor air quality. In order to protect your laminate floors from dents and scratches, place felt protectors or nylon pads under your heavy furniture and replace hard plastic rollers with soft rubber rollers. Finally, laminate flooring is environmentally friendly because it is made from recycled materials such as wood and wood byproducts and therefore does not require the harvesting of rare or endangered trees. With all of these attractive attributes, laminate flooring is the complete package in the field of flooring solutions. This sizable list of endless benefits should put laminate flooring high on your list of options for your next flooring project. Whenever you are ready to install new flooring in your home, contact Speedy Floor Removal. We can help you prepare your house for the incoming material with our floor removal and floor flattening services, and we can also assist you in locating exceptional flooring products at area flooring stores. There is so much to love about laminate, so start moving toward your perfect new floors today with Speedy Floor Removal! In order to best serve the flooring needs of North Central Florida, Speedy Floor Removal wants to continue to share the best information and the latest trends in flooring. One flooring trend in particular that has recently skyrocketed in popularity is wood plank tile, which is ceramic or porcelain tile that imitates the look of real wood floors. Traditional wood flooring has long embodied a classic, sophisticated, and luxurious look, but particular qualities of hardwood flooring make it impractical or impossible for certain rooms in the home or regions in the world. In our blog about hardwood and engineered wood flooring, Speedy Floor Removal discussed the struggle with real hardwood flooring that living in Florida produces. Hardwood flooring is difficult to maintain in Florida because of the high humidity levels of the state’s climate. Hardwood flooring does not do well in moist environments, which is why it is not recommended for bathrooms and kitchens; yet in Florida, hardwood flooring is not recommended for the near-sea level ground floor at all due to the dangers of flooding and rapid mold growth.Therefore, tile flooring is a much better option for states with sea water wafting through the air like Florida, but until now, opting for tile floors meant sacrificing the timeless and stylish look of real wood. Thankfully, the latest advancements in manufacturing technology enables the wood floor-loving homeowners of the South to obtain their dream flooring look without having to move out of state or go to floor care extremes. This fresh new approach to flooring combines the best of both the tile flooring and hardwood flooring worlds and provides an alternative that many will find more advantageous than the real thing. Knowing how quickly Florida homeowners embrace the idea of wood plank tile once they learn of it, Speedy Floor Removal wants to share the many benefits of going with the decorating flow by installing wood plank tile floors in your home. The quality of imitation from certain flooring brands that make wood plank tile can actually be quite astounding: wood plank tile can look so much like real wood to the naked eye that you have to touch it to know the difference. Highly developed technology like digital imaging and inkjet printing equips tile manufacturers to add the details that make the forgery seem more genuine, such as grain, distress, knots, shading variations, hand scraped textures, and glossy finishes. Wood plank tile can pretend to be any type of wood: cherry, acacia, walnut, reclaimed wood, driftwood, petrified wood, etc. Therefore, you can receive all of the beauty and style of classic wood floors while achieving all of the durability, versatility, and simplicity of tile floors. Another advancement that improves the real look of fake wood tiles is the change in sizing. Tiles are no longer limited to the conventional sizes of yesterday. Instead, they can now be made into long rectangular shapes called planks, and this innovation enables them to take on the look of wood with even more realism. With technology and manufactures working so hard to generate tile that looks like wood, homeowners need to remember to maintain the illusion by choosing the correct grout color. When installing wood plank tiles, go for a grout color that matches the tone of the wood as well as possible so as not to throw off the intended look and feel. For darker wood floors, choose a dark grout color rather than a light one, and vice versa, or your “wood” floors will just look funny. Real wood floors are lovely and can look nice for a long time, but when certain elements such as large animals, little children, and a few pairs of high heels are added to an environment with wood floors, their presence can cause wood floors to really suffer. Therefore, tiles floors can offer superior functionality to households in which these elements are permanent features. While real hardwood floors have their merits of being soft and warm, many people feel that tile floors are more durable all around. Tiles floors are definitely not as prone to dent, scratch, warp, crack, or chip as real hardwood floors. They seem to be harder and stronger in the long run, so some people find them easier to preserve over time. Porcelain tile is generally considered to be stronger than ceramic; as it is fired at extremely high temperatures, porcelain tile manages to be especially hard and durable. Wood plank tile is actually so enduring that it will probably last even longer than your personal style preferences: you may want to change it before it even needs to go. If tile floors do endure damage, undoing it is also a bit easier than the usual repair process for hardwood floors. A single tile or multiple tiles can be replaced without having to rip up the entire floor, and for upkeep, instead of resurfacing, refinishing, and resealing a real wood floor every few years, maintaining a tile floor simply involves putting down a new layer of sealer every three to five years to keep moisture from getting into the grout. In certain rooms, real wood flooring really elevates the overall level of flair and distinction of the space; however, in other rooms, hardwood flooring is not even an option. Real hardwood flooring does not do well in rooms with excessive amounts of moisture, such as the bathroom and kitchen, as water that seeps deep into the layers of wood will not dry out easily and can harbor major mold growth. Also, as captivating as wood flooring can be, glistening in the natural glow of a well-lit living room, dining room, or sunroom boasting oversized windows, ages of exposure to sunlight can cause that rich, organic beauty to fade over time. Therefore, tile flooring that emulates wood is much more versatile than actual wood because it really can go in any room and withstand unmonitored amounts of moisture or sunlight. Wood plank tiles can get really wet while serving as a backsplash, and these tiles can also get really warm when used with underfloor radiant heating. Wood plank tile also works much better for accent walls than real wood. Another popular application of wood plank tile is extending the look from floor to ceiling, and the creation of this commanding design feature is better served by tile because when placed against the wall, wood plank tiles will not snag linens or upholstery, nor will they leave homeowners fearing the old lead paint or toxins from wood pallets. Therefore, wood plank tile is the way to go when hoping to literally take the effect of wood up a notch. Tile already affords a greater range of color, design, and pattern options than real wood flooring, and wood plank tiles are no different. With wood plank tiles, the signatures colors of different types of wood are much more accessible, and particular wood patterns such as herringbone and parquet are easier to achieve as well. As wood plank tiles can be made in many different sizes, the variations in plank sizes can be mixed and matched to create previously unattainable, original looks. Wood plank tiles now come in even bigger sizes — some as large as one meter by three meters — and this quality allows homeowners to bring more refined luxury into their spaces. Wood plank tile is especially eco-friendly, as millions of trees do not have to be cut down in order to put the forest outside under your feet inside. Wood plank tile floors provide the cozy and welcoming look of wood without harming a single tree. 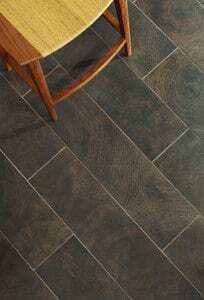 While the initial purchasing price of wood plank tiles can be comparable to that of real hardwood flooring, the cost of labor for tile is less, as the tile installation process is not as intensive as the wood flooring installation process, and maintenance costs of tile are lower than those of wood as well. Also, with the amount of realism that technology can achieve with wood plank tiles, homeowners can get the look of more expensive and exotic woods for a much more reasonable price with tile. Finally, the most significant reason why Florida residents should consider choosing wood plank tiles over real wood floors is that tile simply fairs better in Florida’s subtropical and tropical climates. As previously stated, wood plank tiles withstand moisture better than real wood, which means Florida homeowners can recreate the facade of real wood on the lower levels of the house without having to fear mold overwhelming the floor over time. Also, as Speedy Floor Removal revealed in our blog about tile floors, wood plank tile would keep Florida residents cooler in the summer rather than adding to the sweat-inducing heat. Whether Florida residents use these reasons alone to decide to install wood plank tile or simply add them to the list of other pros wood plank tiles have going for them, it would be unwise for Florida residents to ignore these truths completely when making a major flooring decision. While all of the benefits of wood plank tiles position this novel flooring invention as strong competition to real wood flooring, there is one factor for which North Central Florida residents need to be prepared in order to make the dream of wood plank tiles a reality in their houses. In the process of installing wood plank tiles, homeowners need to ensure that their floors are perfectly flat in order to accommodate the fact that unlike real wood floors, wood plank tiles cannot be leveled out by sanding after they are placed. If the floors do not follow the maximum allowable variation of one-eighth of an inch in a space of ten feet, the insufficiently flat space will magnify the truth that the crown, or the middle section, of a wood plank tile is higher than the outside sections. If homeowners plan to offset their wood plank tiles in order to more convincingly replicate the look of real wood floors, a floor that is not perfectly flat will destroy the resemblance with gaps occurring in the offset sections. Most floors are not quite flat enough nowadays, but Speedy Floor Removal can solve that problem with our floor flattening services. Our floor flattening services remove high spots from the slab and save time and money on bags of leveler. Our ability to flatten floors completely by leveling out every section results in better installation, as the new flooring will adhere directly to the concrete slab instead of another leveler or coating. Therefore, if you are determined to add all of these flooring pros to your home, contact Speedy Floor Removal to get your floors as flat as they need to be to showcase the wonders of wood plank tiles. As “floor” is literally our middle name, Speedy Floor Removal is all about sharing valuable incite into the different types of flooring available to Florida residents who want to make the most of the ground on which they walk. Whether you are currently building your dream home or have lived in the same house for years, there may come a time when new flooring is a necessity, and in those situations, Speedy Floor Removal wants you to be informed. Speedy Floor Removal has already posted a blog detailing every possible positive and negative quality of hardwood and engineered wood floors in Florida, and continuing with the topic of flooring options for Florida residents, we would now like to explain the various types of tile flooring and their effectiveness in local homes and businesses. Tile flooring is a venerable flooring choice that remains practical, economical, and fashionable today, even after millennia of use. The employment of tiles on floors, walls, and ceilings has been in practice for thousands of years, but modern innovations have sustained the durability and desirability of tile flooring for contemporary homeowners. Tile flooring takes up a vast amount of space in the flooring options arena, as the diverse range of textures, shapes, colors, and materials offers limitless options that can satisfy any design style. The definition of tile flooring and what qualifies as such is actually rather broad, but for the purpose of providing a sufficient understanding of the market without carrying on in excess, this article will define only the most popular tile flooring choices. The most popular kinds of flooring can be divided neatly into three groups: ceramic tiles, stone tiles, and alternative materials tiles. Each category of tile flooring has pros and cons to mention, and after learning all the possibilities for tile flooring, it is important to consider the general pros and cons of installing tile flooring in the state of Florida. Lastly, as Speedy Floor Removal wants Florida residents to comprehend everything that goes into the process of upgrading flooring, we will describe what removing tile flooring entails. One of the original types of tile flooring ever created is ceramic tiles, which is a strong option made with natural components. Ceramic tiles come in two forms: non-porcelain ceramic and porcelain ceramic. Non-porcelain ceramic tiles are the more traditional variation made of natural white, red, or brown clay and minerals that have undergone a manufactured process of heating and cooling. The look of non-porcelain ceramic tiles are also quite customizable, as this type of tile affords a great range of sizes, shapes, textures, colors, and finishes from which to choose. Porcelain ceramic tiles also consist of a natural material that endures a manufactured transformation. To make porcelain tiles, very refined clay combined with feldspar, a type of crystal that melts into a glass-like bonding agent, is heated at very high temperatures in order to produce a particularly strong flooring product. Porcelain tiles can be used both indoors and outdoors and can fit into any decorating style with its various colors, textures, and sizes. Porcelain ceramic tiles can be made to look like stone, slate, and wood, and they can be treated so that they are stain resistant and last that much longer. Though ceramic tiles have come a long way from their first formations, they still possess particular pros and cons. For pros, non-porcelain and porcelain ceramic tiles are extremely strong and durable, and they are stain resistant with a consistency that is easy to clean and sterilize. Damaged sections can be replaced quite simply, and these types of tiles come in a great range of colors and designs. In the category of cons, the grout section of ceramic tile flooring can be hard to keep clean, and the fact that these tiles are so hard means they are not very comfortable for living areas and not safe for delicate materials such as glass. Yet ceramic tiles can still find their place in the right kind of room or building, so do not overlook ceramic tile as a viable tile flooring option. The options for stone tiles have been drawn from the inspiring number of minerals present in nature. Stone tiles consist of different rocks that come from all around the world and display various properties that make them perfect for enduring the unending tread of human feet. The list of stone tile types is long, but any one of these stone tile looks could be ideal for the right home or business. Slate: Slate tiles are made from metamorphic rock harvested across the world. Slate tiles are a fine-grained flooring option that can be used indoors and outdoors with a wide range of colors available. Quartzite: Another metamorphic rock that grounds a space in sophistication, quartzite is a multitasking tile that can fulfill both commercial and residential purposes and be featured indoors and outdoors due to its outstanding durability. Quartzite is available in an attractive array of colors and textures to amplify the elegance of any area. Marble: Marble tiles always serve as a stunning floor selection due to limitless colorations and a multitude of refined finishes, such as polished, honed, tumbled, and brushed. Marble tiles create a classic look that can complement any decor. Terrazzo: Terrazzo is a kind of tile made with bits of marble and other stone chips embedded in concrete, then polished to a high sheen. Terrazzo tiles are lovely, easy to maintain, and extremely durable, but they can be even too hard for some households, such as those with children and fragile objects throughout. Granite: Granite tile flooring is a cool look that comes from a hot place, because granite is an igneous rock that forms when lava or magma cools and solidifies. Granite tile provides a great depth of tonal and visual appeal due to the small flecks on its surface that define it. Onyx: For less trafficked areas of your home, consider the softer consistency of onyx, a stone specializing in a smooth and transparent texture that suits indoor floors and countertops in a range of earth tones. Pebbles and Stones: Pebbles and stones is a unique type of tile that can bring nature into a home with an unparalleled level of authenticity. Pebbles and stones tiles transplant natural shapes and tones into the floor of a shower or powder room and bring with them a truly uncommon decor mood. Limestone: Limestone is a sedimentary rock that has been reshaped for flooring purposes while still expressing an earthy appearance through light and dark shades and textured or smooth surfaces. Limestone is not as dense as granite and marble, so it is better for rooms that are less frequented and not as vulnerable to messes. Travertine: Travertine is a limestone byproduct of hot springs from around the globe. Travertine contains minerals of different hues that are mixed while the limestone is forming, and this colorful quality gives each collection of travertine tiles a distinct pattern that adorns your home with a truly original flooring look. As stone tiles are made of a very hard natural material, they are not without their pros and cons. On the positive side, stone tiles are just about the most durable flooring option around, and unlike materials that show stains and scuffs over time, the appearance of stone tiles actually improves with age. Stone tiles are agelessly alluring. On the negative side, not only can stone tiles be very expensive, their installation process can also be quite labor intensive. Certain stone tiles absorb dirt and stains, so they are fairly difficult to clean, and they can also be dangerously slippery when wet. Home and business owners must analyze every condition of their living space and every feature of stone tiles before selecting them, but once installed, stone tiles are sure to make a stunning, timeless statement. Alternative material tiles have been fashioned in factory settings by undergoing chemical procedures that allow tiles made of synthetic or organic materials to replicate the look of natural substances such as wood, stone, or clay. Alternative materials tiles respond to the negative qualities of natural stone or ceramic tiles, such as their price and difficulty of installation. Some types of alternative materials tiles were first manufactured after World War II, so this flooring option has also undergone years of experimentation and improvement. One very well known type of alternative tile is vinyl tile, which is a fairly old flooring option made from plastic that has been upgraded to the point that these tiles can now mimic the look of any other type of flooring, such as wood or stone. Vinyl tile flooring saves time and money with easy installation and inexpensive costs. One popular type of vinyl flooring is vinyl composition tile (VCT), which contains the primary raw ingredient of limestone, a natural substance that serves as a filler material and characterizes VCT with industrial strength. As it is so strong, VCT is commonly used as commercial flooring because it holds up well in public spaces such as retail stores and schools. Another type of alternative materials tile is floating wood tile, which is a type of tile laminate. Floating wood tiles imitate the texture and warmth of real wood but are stain resistant and less expensive. Floating wood tiles can be installed easily when they feature a tongue and groove system that locks into place and avoids the need for adhesive. The last popular type of alternative materials tile to mention is linoleum, a type of tile whose popularity has revived in recent years. Linoleum is made of natural components such as linseed oil and cork dust, and this recipe qualifies it as sturdy, water-resistant, easy to clean, and financially economical. The development of alternative materials tiles has solved many flooring problems but has not forged a flawless type of flooring. 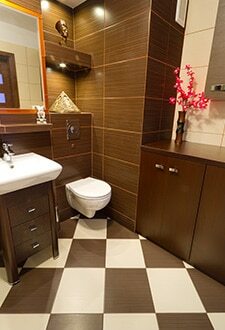 Therefore, home and business owners must acknowledge the pros and cons of alternative materials tiles. Some positive points about these types of tiles include the fact that certain kinds, such as vinyl and linoleum, can be laid down as individual tiles or as whole sheets of tiles that cover a floor in one continuous piece. Vinyl and linoleum are versatile in this way because they consist of material that is much more flexible than other types of tile. Many of the alternative materials tiles are much cheaper than tiles made from stone or ceramic, and they can last a long time with proper cleaning and care. Negative aspects of alternative materials tiles are that they can suffer certain cosmetic wounds that stone and ceramic are more immune to, such as gouges and tears in the tiles that are difficult to repair. Floating wood tiles tend to show scuff marks and cannot be sanded or refinished, so these tiles are more likely to expose excessive wear and tear over time. Consulting the budget and the purpose of the space for which the new flooring is intended will assist home and business owners in determining if alternative materials tiles are the best solution for their flooring needs. Tile flooring can work really well in Florida because it possesses several redeeming qualities for the Sunshine State, but some residents may be unable to ignore its inevitable deficiencies. Still, the positives of tile flooring are many. For one, tile flooring is a great choice for the Florida environment that sweats through high humidity levels. Tiles are tough and water-resistant, which enables them to take on the excessive moisture in the Florida atmosphere without taking it in and harboring mold or mildew. Tile flooring serves especially well in kitchens and bathrooms that generate even more contact with liquid, and tile flooring can withstand the heavy traffic of these areas effortlessly. Tile flooring also keeps the allergies and bacteria at bay when spread out to create super-hard surfaces that will not trap allergens, dust, or dirt. Homes with pets will find extra benefits in tile, as accidental messes are simple to clean on this type of flooring, and the durability of tile can accommodate animal nails. Additionally, tile floors are cool to the touch because they are good conductors of heat, which means that they remove heat from warmer substances such as feet. Tile floors feel great in the Florida heat as they help keep your body and the house cool. The cons of tile flooring are few. Tile can be a difficult flooring material to install, requiring a skilled hand and special tools to cut and place the tile perfectly. Tile flooring also fails to heatproof and soundproof a room, but area runners and rugs can address this problem. Lastly, older tiles can be very slippery when wet if they have not been treated to have the anti-slip surface that modern tile floors have. When approaching the task of removing tile floors, home and business owners should remember that not only is this daunting venture absolutely no fun at all, but it can also be extremely taxing of both time and effort. Attempting to remove tile floors without the help of a professional requires individuals to clear the area of all furniture and appliances and to disconnect any pipes or drains. Then, the grueling work of chiseling away at dozens or even hundreds of square feet of stubborn tile begins. Gloves and safety glasses are essential, and your strategy for removal must adapt to whatever surface to which the tile is connected. A chisel, a sledgehammer, a flat bar, a blade, or a saw will have to serve as your arsenal for the fight, and the battle may rage for days, as even the process of removing a small bathroom floor can take at least half a day. After you have completely cleared the tile away, then you have to remove as much of the adhesive as you can manage, but even when that chore is accomplished, one major trouble will still be looming over you: all that dust. Taking out a tile floor can literally produce pounds of dust, and you will be responsible to clean it all up some way or another. However, Speedy Floor Removal would like to make a suggestion that will not only spare you from all the cleanup, but also allow you to skip out on the demolition as well. Our recommendation: call Speedy Floor Removal to do the job. We are professional floor removers, and we have eradicated countless tile floors with our streamlined and systematic dustless floor removal process. We know exactly how to get rid of that old tile floor and save you so much time and hassle, so call Speedy today to unleash the power of dustless removal on your tile floor.